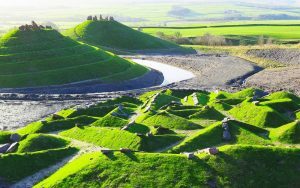 Academics at the University of Nottingham would like to see the 150,000 abandoned coal mines in the United Kingdom converted into subterranean farms. According to their research, the so-called “deep farms” could grow 10 times as much food per acre at a fraction of the cost. Like geothermal greenhouses, the farms would use free heat from the Earth’s core to allow year-round crop production. The researchers say the mines, that once contributed to climate change, are the perfect environment for sheltering crops from its effects. Underground farms are unaffected by irregular seasons, cold winters and erratic weather patterns. The temperature and humidity levels are generally consistently temperate underground. 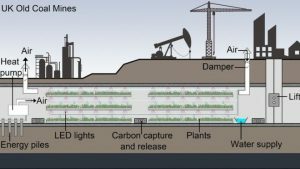 Ground water would provide a ready water supply, and carbon capture technology could sequester CO2 from the atmosphere and bring it down to the plants where it’s needed. While greenhouses are usually too costly to operate in the winters, taking them underground would eliminate the need for heating them. 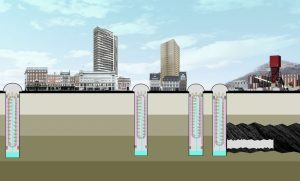 “Tunnels and shafts would need less energy for heating, so are very attractive for food production ,” President of the World Society of Sustainable Energy Technology Saffa Riffat told the BBC. “They’re almost perfect,” she said. Because the farms are not dependent upon the seasons they can acheive up to 10 crop cycles per year as opposed to 1 to 2 cycles in normal agriculture, producing up to 80 tons of food annually. Because of this, one indoor acre is equivalent to 4-6 outdoor acres, Riffat says. Riffat sees underground farming as the perfect solution for feeding a growing global population in a world where conventional agriculture is contributing to food insecurity. If the deep farms are located close to the cities and towns they serve, they could help reduce the CO2 emissions of farming and cut down on transportation costs at the same time, a Popular Mechanics article points out. Lighting would either be from LED lights which are now extremely cheap to buy and run or fibre-optic technology which can tunnel sunlight up to 40 metres into the ground. A former World War Two air-raid shelter 100ft under Clapham Common, London, is already being used to grow greens for local supermarkets and restaurants. I wonder how Charles Jencks feels about your using pictures of his wonderful sculptures to promote novel farming practices? in the past couple of days, I have been thinking about something similar for the home garden, so good timing. It certainly would be something to see. I want to be involved in this adventure. I am from the coal Hills of south West, Va. By taking a few steps we could help that area and more. To Grow,…Plants need the actual Sunlight,…so I don’t see LED lights providing the light they need…The farther you go into the Earth,…and some coal mines are 1-2 miles in depth where it gets quite warm and fresh air has to be brought down to the miners,… so of course the warmer you get,.. that would help the plants,..but until you get the actual Sunlight to them,..I am not so sure of the success you’ll have.